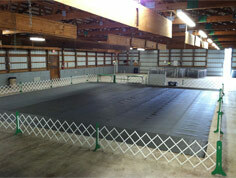 Rent our Eau Claire indoor space for your event. The Expo Center gives you ultimate flexibility for indoor events . We offer three different spaces so you're sure to find a space that fits your needs. Hold a meeting in one of our two meeting areas or combine them for meetings of up to 150 people. Our smaller room (40' x 19') seats 50 people while our larger meeting room (40'x 39') seats 100 people. We also provide free WiFi and a large whiteboard for your convenience. 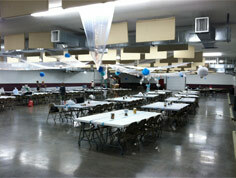 If you're looking for something a little bigger, consider our spacious Exhibit Hall (66' x 156'). Ready to reserve your meeting space at the Eau Claire Expo Center? Check out our rental rates to start planning your budget. Then hop on over to the Contact Us page to book your event at the Expo Center! Get cookin' with our commercial grade kitchen! This brand new facility has every thing you need to create a delectable feast for your next Eau Claire event! You can also rent out the kitchen to help launch your new food product line! If you have dreams of opening your own bakery, catering, or food manufacturing business, our commercial kitchen is perfect! Simply rent our newly remodeled kitchen on a per diem basis while you cook, create, and consume your culinary masterpieces! Located directly off Interstate 94 and Wisconsin 93, The Eau Claire Expo Center is also within a short distance of many major grocery stores, just in case you forgot that perfect ingredient. Get in touch! Our event specialists can work with you to make our space work perfectly for your needs. Book your event today! The PA system throughout our main building allows you to instantly communicate with any size crowd. Besides being a great space to hold events, The Expo Center also has multiple large buildings great for storing vehicles, boats, or equipment.